The aim of this paper is to review the literature and identify orofacial manifestations of hematological diseases, with particular reference to anemias and disorders of hemostasis. A computerized literature search using MEDLINE was conducted for published articles on orofacial manifestations of hematological diseases, with emphasis on anemia. Mesh phrases used in the search were: oral diseases AND anaemia; orofacial diseases AND anaemia; orofacial lesions AND anaemia; orofacial manifestations AND disorders of haemostasis. The Boolean operator "AND" was used to combine and narrow the searches. Anemic disorders associated with orofacial signs and symptoms include iron deficiency anemia, Plummer-Vinson syndrome, megaloblastic anemia, sickle cell anemia, thalassaemia and aplastic anemia. The manifestations include conjunctiva and facial pallor, atrophic glossitis, angular stomatitis, dysphagia, magenta tongue, midfacial overgrowth, osteoclerosis, osteomyelitis and paraesthesia/anesthesia of the mental nerve. Orofacial petechiae, conjunctivae hemorrhage, nose-bleeding, spontaneous and post-traumatic gingival hemorrhage and prolonged post-extraction bleeding are common orofacial manifestations of inherited hemostatic disorders such as von Willebrand's disease and hemophilia. A wide array of anemic and hemostatic disorders encountered in internal medicine has manifestations in the oral cavity and the facial region. Most of these manifestations are non-specific, but should alert the hematologist and the dental surgeon to the possibilities of a concurrent disease of hemopoiesis or hemostasis or a latent one that may subsequently manifest itself. A wide array of hematological disorders encountered in internal medicine has manifestations in the oral cavity and the facial region. Most of these manifestations are non-specific, but should alert the hematologist and the dental surgeon to the possibilities of a concurrent hematological disorder or a latent one that may subsequently manifest itself. These manifestations must be properly recognized if the patient is to receive appropriate diagnosis and referral for treatment. The importance of understanding the orofacial manifestations of these disorders also lies in the fact that orofacial signs and symptoms may be the first clinical presentation that alerts the dentist/hematologist to an underlying hematological disorder. In this review of orofacial manifestations of hematological disorders, orofacial manifestations of anemia and disorders of hemostasis are discussed. A computerized literature search using MEDLINE was conducted for published articles on orofacial manifestations of hematological diseases, with emphasis on anemia. Mesh phrases used in the search were: oral diseases AND anaemia; orofacial diseases AND anaemia; orofacial lesions AND anaemia; orofacial diseases AND anaemic disorders. The Boolean operator "AND" was used to combine and narrow the searches. The full texts of these articles were thoroughly examined. References in these articles were also manually searched for non-Medline articles. Only relevant articles were selected for the review. Sickle cell disease is generically used to describe a group of disorders characterized by the production of abnormal hemoglobin S (HBS). The entities include sickle cell anemia (HbSS), sickle cell Hb C disease (HbSC) and sickle cell-β thalassaemia. The hallmark features of sickle cell disease are chronic hemolytic anemia and vaso-occlusion resulting in ischemic tissue injury. While a wide spectrum of complications result from these, the major manifestation of concern is "sickle crisis" of aplastic, hemolytic or painful (vaso-occlusive) types leading to devastating multisystem complications, including stroke, pulmonary disease, delayed growth, osteomyelitis, organ damage and psychosocial dysfunction. All tissues and organs within the body are at risk of damage due to sickling. The possibility of blood extravasations and hematoma secondary to sickle cell anemia-induced hemorrhage should be considered as a working diagnosis of a facial swelling in sickle cell disease. Scipio et al. reported a case of a 14-year-old boy with sickle cell-related hemorrhage who developed an acute facial swelling, mimicking facial cellulitis of dental origin. Surgical exploration, however, revealed a large hematoma between the periosteum and the lateral aspect of the ramus of the mandible. Pools of blood were also found within the buccinators muscle. The boy also exhibited gingival enlargement, which was considered to be an outcome of repeated hemorrhagic episodes and fibrous repair. Gingival biopsies reported the presence of erythrocyte-filled intraepithelial blood vessels in the gingival epithelium. These are a group of inherited hemolytic anemia involving defects in the synthesis of either the αor the β polypeptide chains of hemoglobin (α-thalassaemia, β-thalassaemia). Based on genetic and clinical entities, thalassaemia are classified as homozygous, heterozygous or compound heterozygous. The heterozygous form of the disease (thalassaemia minor) is mild and usually asymptomatic, the only manifestation being hypochromic microcytic anemia. The homozygous form of β-thalassaemia (thalassaemia major) exhibits the most severe clinical symptoms with marked orofacial deformities. The onset of symptoms occurs early in infancy and the patients are severely anemic and have a short life expectancy. Patients with the most severe form of the disease rarely survive into adulthood because of cardiac failure, chronic anemia and hypoxia. , However, with modern management, the prognosis has greatly improved. The vascular disorders are a heterogenous group of conditions characterized by easy bruising and spontaneous bleeding from the small vessels. Frequently, the bleeding is mainly in the skin, causing petechiae, ecchymoses or both and in some cases there is bleeding also from the mucous membrane. Vascular defect of hemostasis may be acquired or inherited. Most cases of bleeding from the vascular defect alone are not severe or life threatening. Hereditary hemorrhagic telangiectasia  and Ehlers-Danlos syndrome More Details,  in which some patients express the characteristic facial appearance of large eyes, small chin, thin nose and lips, lobeless ears are examples of hereditary vascular disorders that may present with petechiae or ecchymotic lesions on the lips, tongue and oral mucosa and epistaxis. Hemarthrosis is a common complication in a hemophiliacs' weight-bearing joints, yet it rarely occurs in the temporomandibular joint (TMJ). There are very few reported case of TMJ hemarthrosis. , Chronic hemophilic TMJ arthropathy may also occur, which requires arthrotomy, arthroscopic adhesion lysis, factor replacement, splint therapy and physical therapy. The treatment of patients with either hemophilia A or hemophilia B involves the replacement of the deficient clotting factors by intravenous infusion to either control or prevent bleeding. Patients with mild factor VIII deficiency may be treated with DDAVP to raise the factor VIII level. Preventive and restorative dental care, particularly for the patient with hereditary hemostatic disorder, is of paramount importance for the fact that advanced dental conditions and subsequent treatments have proven to be more complicated and risky. ,,, Quite often, dental health is neglected by hemophiliacs for fear of bleeding during procedures. Surprisingly, even dental specialists avoid these candidates and contribute to the conversion of a simple dental patient to an oral surgical patient. , The complexities involved in diagnosing a bleeding disorder and the rarity of a standardized protocol to handle such patients contribute to this problem. A wide array of disorders of red cells and hemostasis encountered in internal medicine has manifestations in the oral cavity and the facial region. Most of these manifestations are non-specific, but should alert the hematologist and the dental surgeon to the possibilities of a concurrent disease of hemopoiesis or hemostasis or a latent one that may subsequently manifest itself. These manifestations must be properly recognized if the patient must receive appropriate diagnosis and referral for treatment. Proper diagnosis is essential to initiate the correct treatment. 1. Long RG, Hlousek L, Doyle JL. Oral manifestations of systemic diseases. Mt Sinai J Med 1998;65:309-15. 2. McFarlane DB, Pinkerton PH, Dagg JH, Goldberg A. Incidence of iron deficiency, with and without anaemia, in women in general practice. Br J Haematol 1967;13:790-6. 3. Aster J, Kumar V. White cells and lymph nodes. In: Cotran RS, Kumar V, Collins T, editors. Robbins Pathologic Basis of Disease. 6 th ed, Kidlington, Oxford: WB Saunders; 1999. p. 657-8. 4. Hou GL, Huang JS, Tsai CC. Analysis of oral manifestations of leukaemia: A retrospective study. Oral Dis 1997;3:31-8. 5. Stafford R, Sonis S, Lockhart P, Sonis A. Oral pathoses as diagnostic indicators in leukemia. Oral Surg Oral Med Oral Pathol 1980;50:134-9. 6. Toygar HU, Guzeldemir E. Excessive gingival bleeding in two patients with Glanzman Thrombastenia. J Periodontol 2007;78:1154-8. 7. Zegarelli DJ. Fungal infections of the oral cavity. Otolaryngol Clin North Am 1993;26:1069-89. 8. Hoffman RM, Jaffe PE. Plummer-Vinson syndrome: A case report and literature review. Arch Intern Med 1995;155:2008-11. 9. Faccini JM. Oral manifestations of vitamin B12 deficiency. Br J Oral Surg 1968;6:137-40. 10. Field EA, Speechley JA, Rugman FR, Varga E, Tyldesley WR. Oral signs and symptoms in patients with undiagnosed vitamin B 12 deficiency. J Oral Pathol Med 1995;24:468-70. 11. Embury SH. The not so simple process of sickle cell vasoocclusion. Microcirculation 2004;11:101-13 . 12. Davies SC, Brozoviæ M. The presentation, management and prophylaxis of sickle cell disease. Blood Rev 1989;3:29-44. 13. Konotey-Ahulu FI. The Sickle cell disease: Clinical manifestations including the 'sickle cell crisis'. Arch Intern Med 1974l;133:611-9. 14. Brown DL, Sebes JI. Sickle cell gnathopathy: Radiologic assessment. Oral Surg Oral Med Oral Pathol 1986;61:653-6. 15. Morris AL, Stahl SS. Intraoral roentgenographic changes in sickle cell anaemia, a case report. Oral Surg Oral Med Oral Pathol 1954;7:787-91. 16. Prowler JR, Smith EW. Dental bone changes occurring in sickle cell diseases and abnormal haemoglobin traits. Radiology 1955;65:762-9. 17. Mourshed F, Tuckson CR. A study of the radiographic features of the jaws in sickle cell anaemia. Oral Surg Oral Med Oral Pathol 1974;37:812-9. 18. Walker RD, Schenck KL Jr. Infarct of the mandible in sickle cell anaemia: Report of a case. J Am Dent Assoc 1973;87:661-4. 19. Hammersley N. Mandibular infarction occurring during a sickle cell crisis. Br J Oral Maxillofac Surg 1984;22:103-14. 20. Patton LL, Brahim JS, Travis WD. Mandibular osteomyelitis in a patient with sickle cell anaemia: Report of a case. J Am Dent Assoc 1990;121:602-4. 21. Shroyer JV 3rd, Lew D, Abreo F, Unhold GP. Osteomyelitis of the mandible as a result of sickle cell disease: Report and literature review. Oral Surg Oral Med Oral Pathol 1991;72:25-8. 22. Olaitan AA, Amuda JT, Adekeye EO. Osteomyelitis of the mandible in sickle cell disease. Br J Oral Maxillofac Surg 1997;35:190-2. 23. Friedlander AH, Genser L, Swerdloff M. Mental nerve neuropathy: A complication of sickle cell crisis. Oral Surg Oral Med Oral Pathol 1980;49:15-7. 24. Gregory G, Olujohungbe A. Mandibular nerve neuropathy in sickle cell disease: Local factors. Oral Surg Oral Med Oral Pathol 1994;77:66-9. 25. Andrews CH, England MC Jr, Kemp WB. Sickle cell anaemia: An aetiological factor in pulpal necrosis. J Endod 1983;9:249-52. 26. Kelleher M, Bishop K, Briggs P. Oral complications associated with sickle cell anaemia: A review and case report. Oral Surg Oral Med Oral Pathol Oral Radiol Endod 1996;82:225-8. 27. Okafor LA, Nonnoo DC, Ojehanon PI, Aikhionbare O. Oral and dental complications of sickle cell disease in Nigerians. Angiology 1986;37:672-5. 28. Taylor LB, Nowak AJ, Giller RH, Casamassimo PS. Sickle cell anaemia: A review of the dental concerns and a retrospective study of dental and bony changes. Spec Care Dentist 1995;15:38-42. 29. O'Rourke CA, Hawley GM. Sickle cell disorder and orofacial pain in Jamaican patients. Br Dent J 1998;185:90-2. 30. Stinson J, Naser B. Pain management in children with sickle cell disease. Paediatr Drugs 2003;5:229-41. 31. Scipio JE, Al-Bayaty HF, Murti PR, Matthews R. Facial swelling and gingival enlargement in a patient with sickle cell disease. Oral Dis 2008;7:306-9. 32. Saint Clair de Velasquez Y, Rivera H. Sickle cell anaemia oral manifestations in a Venezuelan population. Acta Odontol Latinoam 1997;10:101-10. 33. Weatherall JD, Clegg JB. The thalassaemia syndromes. 3 rd ed, Oxford: Blackwell Scientific: 1981. p. 132-74. 34. Modell B. Management of thalassaemia major. Br Med Bull 1976;32:270-6. 35. Weel F, Jackson IT, Crookendale WA, McMichan J. A case of thalassaemia major with gross dental and jaw deformities. Br J Oral Maxillofac Surg 1987;25:348-52. 36. Kaplan RI, Werther R, Castano FA. Dental and oral findings in Cooley's anemia: A study of fifty cases. Ann N Y Acad Sci 1964;119:664-6. 37. Cannell H. The development of oral and facial signs in  thalassaemia major. Br Dent J 1988;164:50-1. 38. Van Dis ML, Langlais RP. The thalassaemias: Oral manifestations and complications. Oral Surg Oral Med Oral Pathol 1986;62:229-33. 39. Hes J, van der Waal I, de Man K. Bimaxillary hyperplasia: The facial expression of homozygous  thalassaemia. Oral Surg Oral Med Oral Pathol 1990;69:185-90. 40. Abu Alhaija ES, Hattab FN, al-Omari MA. Cephalometric measurements and facial deformities in subjects with  thalassaemia major. Eur J Orthod 2002;24:9-19. 41. Sepúlveda E, Brethauer U, Rojas J, Le Fort P. Oral manifestation of Aplastic anaemia in children. J Am Dent Assoc 2006;137:474-8. 42. Girolami A, Luzzatto G, Varvarikis C, Pellati D, Sartori R, Girolami B. Main clinical manifestations of a bleeding diathesis: An often disregarded aspect of medical and surgical history taking. Haemophilia 2005;11:193-202. 43. Malfait F, De Paepe A. Bleeding in the heritable connective tissue disorders: Mechanisms, diagnosis and treatment. Blood Rev 2009;23:191-7. 44. da Silva Santos PS, Fernandes KS, Magalhães MH. Osler-Weber-Rendu syndrome--dental implications. J Can Dent Assoc 2009;75:527-30. 45. Létourneau Y, Pérusse R, Buithieu H. Oral manifestations of Ehlers-Danlos syndrome. J Can Dent Assoc 2001;67:330-4. 46. Martini MZ, Lopez JS Jr, Gendler JL, da Fonseca EV, Soares HA, Franzi SA. Idiopathic thrombocytopenic purpura presenting as post-extraction haemorrhage. J Contemp Dent Pract 2007;8:43-9. 47. Chandra J, Ravi R, Singh V, Narayan S, Sharma S, Dutta AK. Bleeding manifestations in severely thrombocytopenic children with immune thrombocytopenic purpura. Hematology 2006;11:131-3. 48. Nurden AT. Inherited abnormalities of platelets. Thromb Haemost 1999;82:468-80. 49. Young G, Luban N, White JG. Giant platelet disorders in African-American children misdiagnosed as idiopathic thrombocytopenic purpura. J Pediatr Hematol Oncol 1999;21:231-6. 50. Hassan AA, Kroll MH . Acquired disorders of platelet function. Hematology Am Soc Hematol Educ Program 2005;1:403-8. 51. Report on the Annual Global Survey 2007. World Federation of Hemophilia; 2008. 52. Rodeghiero F, Castaman G, Dini E. Epidemiological investigation of the prevalence of von Willebrand's disease. Blood 1987;692:454-9. 53. Miller CH, Graham JB, Goldin LR, Elston RC. Genetics of classic von Willebrand's disease: I. Phenotypic variation within families. Blood 1979;54:117-36. 54. Goodeve A, Eikenboom J, Castaman G, Rodeghiero F, Federici AB, Batlle J, et al. Phenotype and genotype of a cohort of families historically diagnosed with type 1 von Willebrand disease in the European study, Molecular and Clinical Markers for the Diagnosis and Management of Type 1 von Willebrand Disease (MCMDM-1VWD). Blood 2007;109:112-21. 55. Kasper CK. Hereditary plasma clotting factor disorders and their management. Haemophilia 2000;6:13-27. 56. Rakocz M, Mazar A, Varon D, Spierer S, Blinder D, Martinowitz U. Dental extractions in patients with bleeding disorders. Oral Surg Oral Med Oral Pathol 1993;75:280-2. 57. Sonis AL, Musselman RJ. Oral bleeding in classic haemophilia. Oral Surg Oral Med Oral Pathol 1982;53:363-6. 58. Kaneda T, Shikimori M, Watanabe I, Minato F, Koide Y, Inoue N, et al. The importance of local hemostatic procedures in dental extractions and oral mucosal bleeding of haemophiliac patients. Int J Oral Surg 1981;10:266-71. 59. Kaneda T, Nagayama M, Ohmori M, Minato F, Nakajima J, Shikimori M. Hemarthrosis of the temporomandibular joint in a patient with hemophilia B: Report of case. J Oral Surg 1979;37:513-4. 60. Nishioka GJ, Van Sickels JE, Tilson HB. Hemophilic arthropathy of the temporomandibular joint: Review of the literature, a case report, and discussion. Oral Surg Oral Med Oral Pathol 1988;65:145-50. 61. Bolton-Maggs PH, Perry DJ, Chalmers EA, Parapia LA, Wilde JT, Williams MD, et al. The rare coagulation disorders review with guidelines for management from the UKHCDO. Haemophilia 2004;10:593-628. 62. Mannucci PM, Duga S, Peyvandi F. Recessively inherited coagulation disorders. Blood 2004;104:1243-52. 63. Bolton-Maggs PH, Young Wan-Yin B, McCraw AH, Slack J, Kernoff PB. Inheritance and bleeding in factor XI deficiency. Br J Haematol 1988;69:521-8. 64. Bolton-Maggs PH. Factor XI deficiency and its management. 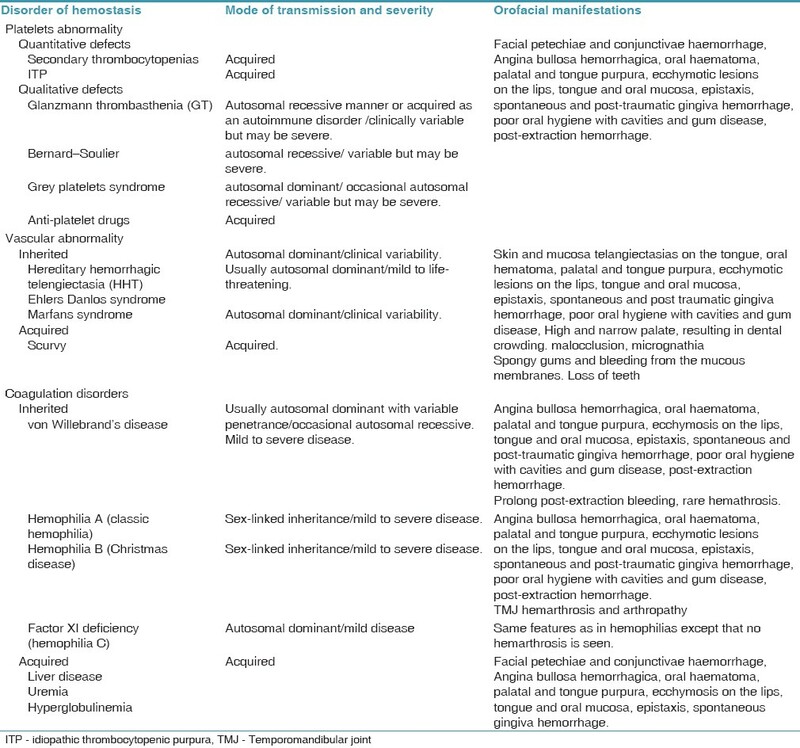 Treatment of Hemophilia monographs. 3 rd ed, vol 16. World federation of Hemophilia; 2008. p. 1-18. 65. Brenner B, Lupo H, Laor A, Zivelin A, Lanir N, Seligsohn U. Predictors of bleeding in factor XI deficiency. Thromb Haemostas 1995;73:1441. 66. Seligsohn U. Factor XI deficiency. Thromb Haemost 1993;70:68-71. 67. O'connell NM. Factor XI Deficiency. Semin Hematol 2004;41:76-81.
laurence, b. and haywood jr., c. and lanzkron, s.
paulusova, v. and radocha, j. and slezák, r.
Adeyemo, T. and Adeyemo, W. and Adediran, A. and Akinbami, A.J. and Akanmu, A.